All fluvial and estuarine environments exhibit temporal variations in flow discharge, which creates unsteady changes in the flow field. 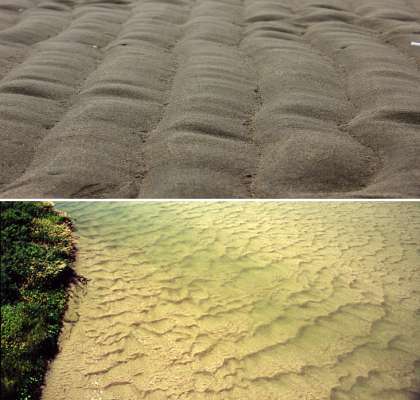 The sediment-water interface responds and organises to these changes over a wide range of spatial and temporal scales, primarily through adjustment of a variety of bed roughness elements (i.e. bedforms: ripples, dunes and larger bar forms). In sand-bed, lowland rivers and estuarine environments, where most large population centres are located, these roughness elements are the key component of overall flow resistance and the magnitude of their form drag significantly influences river stage levels for given discharges. For example, recent research on the Rhine has shown stage levels to vary by up to 2 m depending upon the presence of bedforms and their evolution during flooding events. bedform-flow unsteadiness hysteresis with bedforms known to exhibit a range of phase lags (or loops) in response to changing flow conditions, often with complex processes such as bedform superimposition, splitting and amalgamation. The incorporation of these dynamically evolving processes is key to quantifying better the evolving roughness, in time and/or space, in response to changes in flow and will provide knowledge that is of significance for improved morphodynamic modelling over large spatial and temporal scales, more reliable flood predictions, enhanced and informed engineering design and management, international shipping operations, and dredging and environmental management.